In 1996, Barbara's husband died after a 2 year battle with cancer. Barbara was with him every step of the way. Then, a month-and-a-half after his death, Barbara's 16 year old daughter, Hope, was hit by a car, while crossing a street on her way home from school. She was on life support for 5 days. Although communication with words was impossible, Barbara was able to determine that Hope's wish was to be an organ donor, so that was done after her death. Fourteen months after Hope's death, Barbara's 18-year-old son, Eric was changing a tire on a bridge when he was hit and killed by a drunk driver. This left Barbara and her only remaining child, Amanda stunned and alone. During the evening after Eric's funeral, Barbara received a call from one of the five people who had received Hope's organs. It was a young man, close to Eric's age, and he had Hope's heart. On such a dismal day, this was a big comfort to both Barbara and Amanda. Barbara has been living in Piedmont, Missouri for the 10 years since. Recently flooding caused much devastation in Piedmont. Though the living area of Barbara's home didn't flood, the old retaining wall in her basement was about to give way late one night. In a panic, she called a fix-it man who came out and was able to temporarily divert the water. The next morning, as Barbara was driving in town, she felt a prompting to make a U-Turn and drive into a church parking lot where a large Samaritan's Purse Disaster Relief trailer and trucks were parked. Upon entering the church, Barbara was soon greeted by 2 BGEA Rapid Response Team Chaplains. With tears streaming down her face, Barbara told the Chaplains about the scare of seeing the water coming into her basement. Not even knowing of the prior tragedies in her life, the Chaplains took time to comfort Barbara in her distress. They then prayed with her, asking the Lord to provide her with the help that she needed and that He would bring her hope and comfort through Christ. Immediately after praying, a SP Team Leader arrived and advised Barbara that a team of SP volunteers would follow her to her home to assess her needs. As the team worked on her home, one of the workers spent time with Barbara and asked if she had ever invited Jesus into her heart. Barbara never had and this was the moment for her as Barbara gratefully accepted Christ as her Lord and Savior! Barbara came back to the church to have dinner with the Chaplains and the SP volunteer work teams. At share time, Barbara stood before the packed room full of volunteers and shared her complete story, including that today was her spiritual birthday. She was greeted by applause, hugs, love and much encouragement. Afterward, Barbara stated that she felt she had a new family, and that she did not feel alone anymore. That evening a BGEA Chaplain introduced Barbara to the Church's Pastor. The Pastor then immediately introduced Barbara to a Sister in Christ in the Church, and Barbara is already planning to attend the Church this coming Sunday. If you clicked on the Scripture links above and read them, are they true to your eternal life? 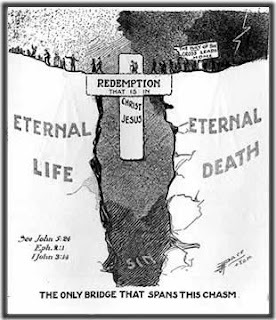 Have you passed from death to life through Jesus Christ? Are the doors of heaven or hell open for you upon your death? Do you hope to go to heaven or do you know that you will go to heaven when you die? How do you know? Retreived on April 19, 2008 from https://www.billygraham.org/News_Article.asp?ArticleID=245.